Here you can see all the awards and accolades I’ve received for my metal clay work. My Growth pendant won first prize in the Beyond Beads category in the British Bead Awards at the Big Bead Show in the UK in 2013. My necklace called Growth came second in the Bead Dreams competition 2013 at the Bead and Button show in the USA. The finalists were on display at the show. 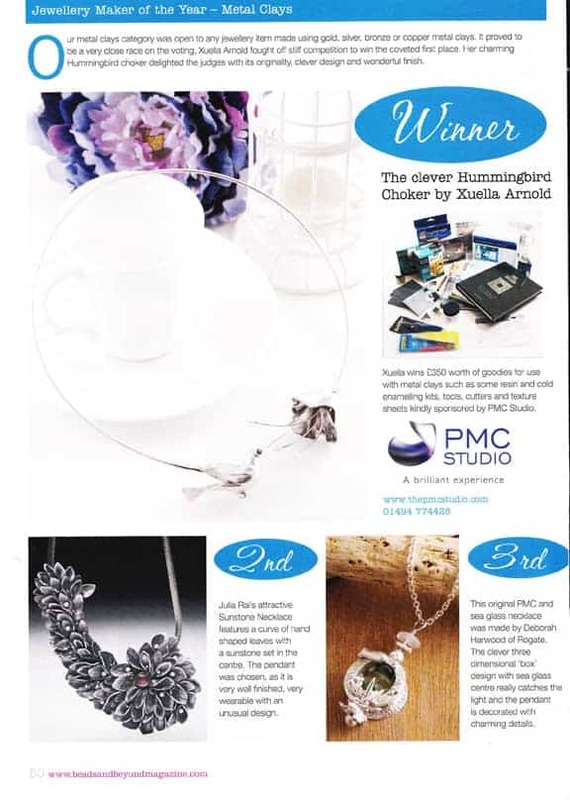 My Sunstone necklace came second in the Beads and Beyond Magazine Jewellery Maker of the Year Competition 2012. 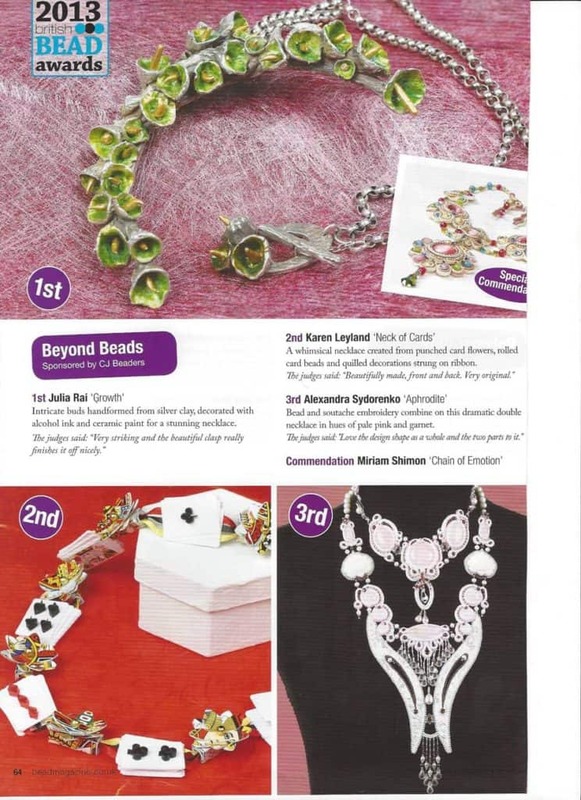 This was a public vote and the piece was printed in the magazine and also on the Beads and Beyond website. 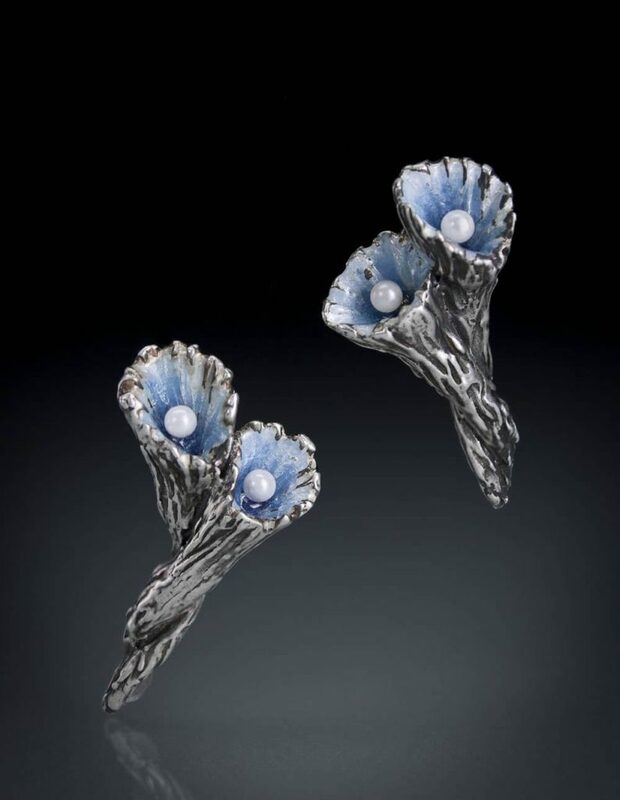 My Pearl and Enamel Earrings were juried into the Bead Dreams competition 2012 at the Bead and Button show in the USA. The finalists were on display at the show from 1st – 10th June 2012. My enamel pearl earrings won first prize in the metal clay category in the British Bead Awards at the Big Bead Show in the UK in 2011. 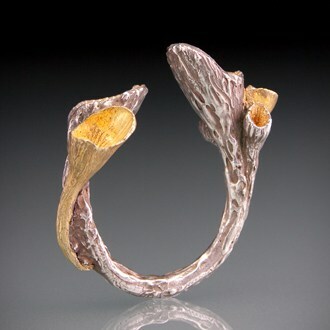 This piece was selected as a finalist in the Saul Bell Design Awards 2011. The overall shape came first with the idea for the petal/leaf elements coming in subsequent sketches. The base shape was made in PMC and dried on a form to dome it slightly. The individual petal/leaf elements were made and each was added separately. Some were applied while still in the wet clay stage and others were dried and applied. Fine silver wires were embedded for the pearls to sit on after firing. Small balls were added. The clasp is behind the largest part of the pendant. It is a hook and bar clasp, the hook part is attached to the chain and the bar is on the back of the pendant. Once fired the pearls were added, the hook and chain were added, a patina was added using liver of sulphur and the stone was set. The piece is 10cms long by 5cms across the widest part. Materials – Silver PMC, 3mm Oregon Sunstone, 2mm pearls, sterling hook and chain. 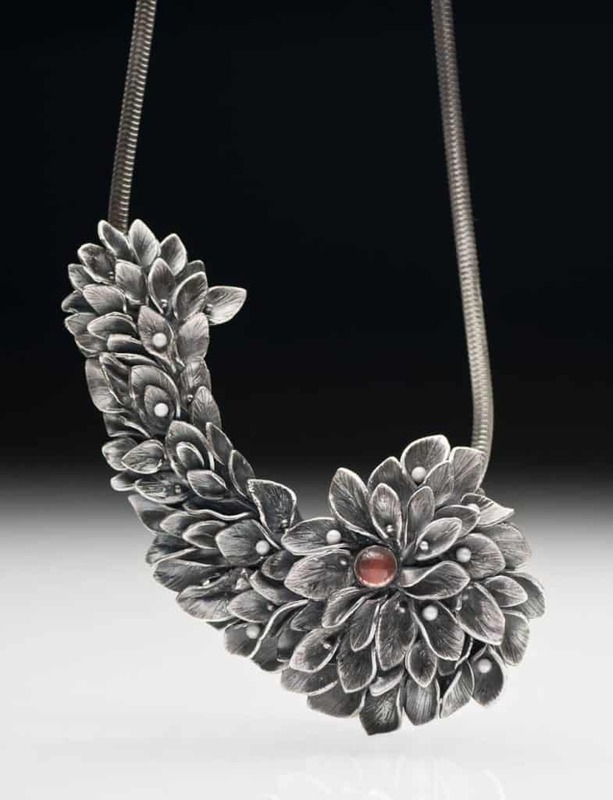 This piece won first prize in the Metal Clay Category of the Bead Dreams Competition at Bead and Button 2011. It is gold and silver metal clay formed into elements that resemble pods. 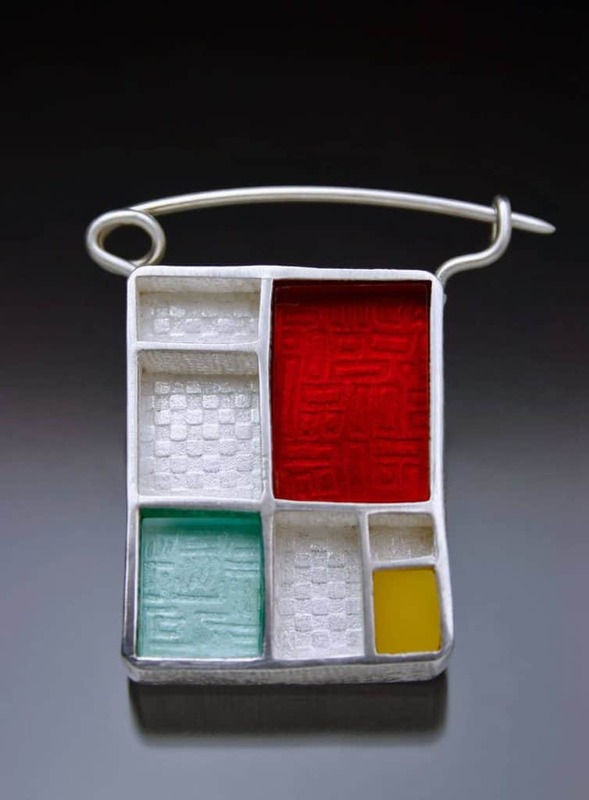 The metal clay and plastic brooch was placed third in the metal clay category of the Bead Dreams competition at Bead and Button 2010.